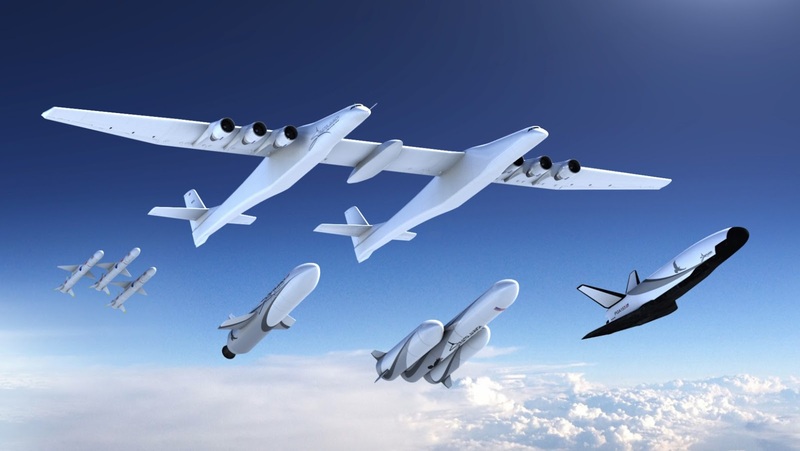 Stratolaunch, The commercial spaceflight firm notably founded by Microsoft co-founder Paul Allen has now unveiled new rockets along with a space plane planned to be use for space missions with the company aiming for these new vehicles to be launched in 4 years time. The new rockets being developed are planned to be launched with its notable giant space plane designed to take rockets to a higher altitude after vertical takeoff for release before an ignition into space. The launch vehicle is still in testing stages and has not actually taken off from ground before but has been taxied along the runway in efforts to study how this new system would be used to launch space vehicles as part of on-going innovation in the market which counts the likes of SpaceX, Blue Origin, Rocket Lab and Boeing as other notable players. Stratolaunch has two medium launch vehicles (MLV) in progress designed to carry just under 7,500lbs to orbit with a heavier planned to be able to carry over 13,200lbs of load. Still in development, We'll get to see how Stratolaunch will make use of its vehicles to provide commercial launches for customers aiming to cement a status as a major firm the private and rapidly growing spaceflight industry which has seen several companies formed and pumped with huge funding from backers to develop new and reliable solutions for customers and users. Earlier this month, NASA unveiled 9 astronauts earmarked to fly on commercial space missions to and from the International Space Station (ISS) marking a good milestone as it'll be the first time commercial aerospace providers handle space missions involving human astronauts being sent into orbit in a bid to return astronaut launches to the US for the first time since the retirement of the NASA Space Shuttle 7 years ago.